Ideally located center town, peaceful,wholly renewed apartment and forniture. Yours friends or parents can enyoy the holiday with you renting the communicating apartment on the same floor with sight over Bordonaro street and the beach on the right. 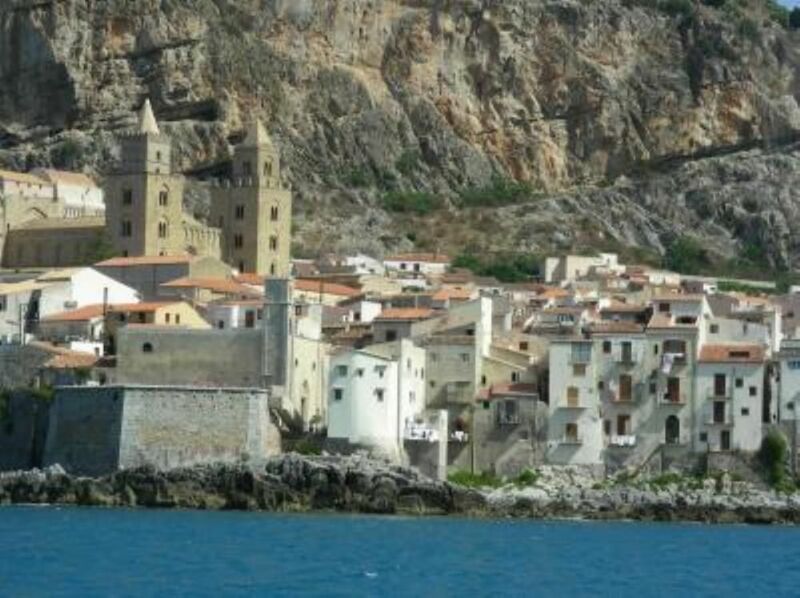 Cefalù is in the heart of the northern coast of Sicily and of Park of Madonie mountains. Every corner of island can be reached by train or highways often returnig home the same day. Hydrofoils seasonal connections to visit Eolie Islands and Palermo. This was the third time we stayed in this unit over the past 10 years. We plan to stay again sometime in the near future. Thanks Neal I am glad to receive jour news I hope to see again you and your wife. I shall be back in Vanzago Milano end of September. Grazie Neal delle tue gentili parole e dei bei ricordi dei contatti avuti con te e tua moglie spero di rivedervi in Sìicilia a Cefalù in un prossimo futuro. I would recommend anyone to go here! The location is great, right in the middle of the city and close to everything. But still some how secluded with all the windows and balcony facing the sea and the sunset. We had calm seas and 26-29 degrees four the whole of our stay and slept with the balcony door open to the Mediterranean Sea, and we slept like babes! It is a big chance that we will return! Thanks for your kind words for my location and the whole town of Cefalù. I am glad you both had a fine holiday in Sicily and wish return in our island suggesting the same experience to your friends. "This studio apartment was in the most wonderful position looking out over the rocks to the sea, and the only noises we could hear were the waves and, each afternoon, church bells. Having said all this, I must say that Carlo was very obliging and happy to help where he could; the apartment although basic was spotlessly clean and we had a great time in Cefalu." It's a very nice appartement with everything you need. Although the appartement was located in the centre of cefalu, we had no noise at all beause the appartement is situated at the seaside. So you have a room with view at sea!! I can recommend this to anyone. You will never sleep better. The owner, Carlo was very friendly and helpfull. He shows you the free parking (very important if you are by car) and gives you lots of information. He even invited us to make a trip on his boat to see Cefalu from the other side. Overall, to be recommended! Bhi saoire iontach again i Cefalu. Is cathair alainn í le neart stair sa cheanntar. Ta an tra go hálainn, bhíomar in ann snámh gach aon lá. Bhí an bia thar barr agus costas an íseal ar béilí, agus fíon. Bhí an árasán go hálainn, an phracticiúil ar fad, le radharc do chreidthe ón bhalcón. Níor raibh aon fhuaim ach an farriage reidh amuigh, agus uaireanta daoine ar ithe béile san bhialann cois trá, chuireadh siad ocras ort! Bhíomar in ann béilí deasa a chócaireacht san árasán chomh maith, gach ní san chistin. Tá Carlo, an fear tí sár dheas, thog sé muid ar turas ina bhád seol (yacht mór alainn) saor an aisce. Táimid chomh sásta gur aimsigh muid an áit seo. Bhí sé i bhfad níos deise ná fanacht in óstán nó "holiday residence". Agus i bhfad níos saoire! Bhi spás codlata i gcomhair cúigear ann, agus tá arasan eile aige san toirgnimh céanna dá mbeadh níos mó daoine. Is dóigh liom go mbeadh sé an oirinach do clann, nó dhá clainn ar saoire le chéile. An oiriunach do bheirt chomh maith! Tá alán le deanamh sa cheantar leis. Mholfainn do gach éinne dul ann, óg nó aosta. We had a wonderful foliday in Cefalu! Its a beautiful city with lots to do and see for people of all ages. The beach is beautiful, and so close to the apartement, we swam at least twice a day, though the italians thaught this was crazy in May, but the water was perfect, and the view of the town from the see is the best you'll get, apart from the view from Carlos (the landlord) sail boat! He took us out to see (no extras cost) and you even get to sail the 33foot sailboat! The apartement was perfect, great view from the balcony of the med, and the only sounds at night were those of the sea, and some people enjoying meals in many of the restaurants by the sea. The food was amazing, and incredibly cheap in comparison to Ireland or England. the apartement is suitable for a couple, and would also be ideal for a family, it sleeps 5. Staying in the centre of such a lovely town was such a nicer experience than holidays in "residences" or hotels. I would advise a trip to Cefalu to anyone, old or young! Questo appartamento era perfetto per la nostra vacanza in Cefalu. Carlo (il padrone) era molto gentile e siamo molto contenti che abbiamo scegliato questo appartamento. Tutto era molto comodo, e anche il appartamento e veremente in centro, e vicino mare. quindi era ideale. La spiaggia e molta bella, e perfetto per bagnare (anche in Maggio!! ). C'era anche la possibilita di fare una gita in barca vela, gratis. La barca e bellisimma. speriamo di tornare in Cefalu e certamente se riusciamo, affitiamo questo appartamento di nuovo!" The accomodation is excellent, clean, comfortable, with good facilities the view from the balcony is outstanding. No noise problems at all, just the sound of the sea. The town of Cefalu' was very enjoyable: Very pretty, a good beach and some excellent restaurants. Overall, I would highly recommend. I definitely plan to return." Take the highway,Palermo Messina go off at Cefalù,take the national street and turn ,after the town, to the left towards the Presidiana port of Cefalù.Go towards the center and when you reach the Corso Ruggiero(tabac label on the right corner)turn to the right and at the Corso end on the left to Bordonaro Street.You can reach us by car to dischare luggage from 5 to 10 a.m. and from 1 to 5 p.m. and also in other hours asking ermission to City Police officers eventually on service to the entrance of Limited Trafic Zone. Free parking to 300 mt,payment parking euro 1,00 hour,garage to 800 mt. Sailing and motor boats. bykes,scooters,cars to rent. Sailing ,diving, italian and others languages schools. Tennis courts 1 km.Riding 4 km.Golf 18 km.